From Ko Phi Phi I still remember the adrenaline running through my body while trying to spot leopard sharks and black tip reef sharks on a adventurous snorkel trip. Just as intense were my other experiences like a tuk tuk ride through chaotic Bangkok or a visit to the colourful floating market in Damnoen Saduak. 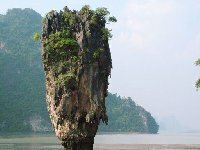 James Bond Island, photos of.. I will never forget the beauty of the Similan Islands, off Thailands west coast and north of Phuket and Khao Lak. 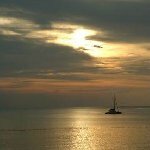 Visiting this post tsunami area is the best way to help the locals and see a beautiful part of Thailand at the same time! Besides, the Similan Islands are still one of the most stunning and less known destinations. Two other gems in the Thai waters are Phi Phi Island, known from the popular movie The Beach, and James Bond Island, also known from the theatres as an impressive setting from OO7, The Man with the Golden Gun. Visiting these natural wonders will take your breath away for at least a couple of minutes. After having travelled different countries over the world, I still believe I always carry a piece of Thailand with me and it's a country that really stole my heart! Did you enjoy From Bangkok to the islands of Thailand and have you been on a holiday in Bangkok, Thailand? Disliked: Bangkok can be a bit chaotic but definitely worth a visit!